Saintly martyr: Archbishop Oscar Romero. WHEN Brisbane’s German Silva attends this weekend’s canonisation of El Salvador’s first saint Archbishop Oscar Romero, in Rome, he will remember “a spiritual father” who offered “many key messages” throughout their five-year friendship. As a teenage catechist, Mr Silva was influenced by Archbishop Romero’s humility. “I’ll never forget Monsignor Romero said catechists must respect the teachings of the Church, as the messenger, not the message,” Mr Silva said. The Sunnybank parishioner said Archbishop Romero preferred to be addressed as Monsignor Romero because of a desire “to be known as a brother in Christ”. “Monsignor Romero said, ‘The will of God made me a bishop to serve you … (and) priests and bishops are your servants, your brothers in Christ’,” Mr Silva said. Archbishop Romero’s humility was seen in his frequent visits to poorer regions of El Salvador, Mr Silva said. “He went everywhere, especially to shanty towns,” he said. 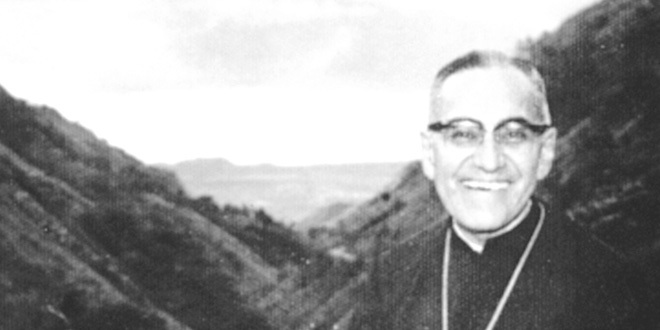 “Monsignor Romero’s mission was to preach the Gospel and that Gospel compelled him to fight injustice. During the political unrest and military oppression of El Salvador’s civil war in the 1980s, began an uprising against unjust work and living conditions. Priests, religious, catechists and teachers, of which Mr Silva knew countless within his years of catechetical ministry, were targeted for their loyalty to preaching and the Church’s mission of outreach. 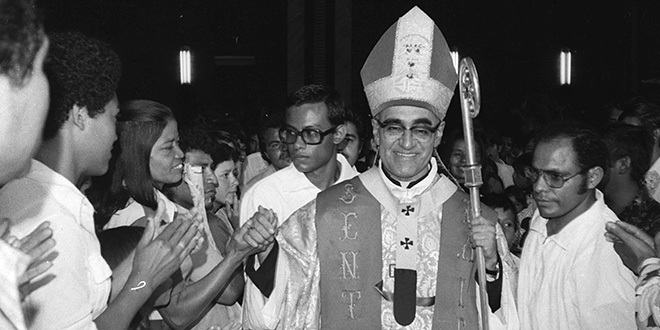 Archbishop Romero was martyred celebrating Mass in a hospital chapel in El Salvador on March 24, 1980, and more than 200,000 people attended his funeral six days later. 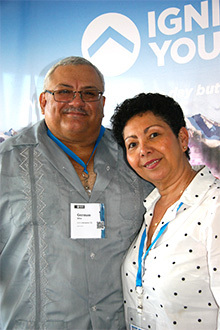 Canonisation pilgrim: German Silva will attend the canonisation of El Salvador’s Archbishop Oscar Romero in Rome, and his wife Gloria will await contact from their Brisbane home. Mr Silva said Salvadorans “held tightly” to the views of Archbishop Romero, “glued” to radios and any means to hear him preach. “Saints, like Monsignor Romero, are like prophets … (and he was) a prophet who denounced the injustices of the people and the powerful who oppressed the people,” he said. Mr Silva said another of Archbishop Romero’s key messages was the pursuit and declaration of truth. “The truth is always persecuted,” Mr Silva said. “Jesus Christ said, ‘If they persecuted me, they will persecute you’. “Monsignor Romero said, ‘If the Church is not being persecuted, something is wrong; we are not doing enough to present the Word of God to the people’. “If we are going along in a merry way, we are not confronting hearts and he said that’s not a true Church. Mr Silva said Archbishop Romero spoke of Jesus Christ compelling “a change of heart”. “Monsignor Romero would say, ‘Jesus came to confront us with our sin but, by confront us, he demands a change of heart’,” he said. Speaking at the September 27-30 Ignite Conference, Mr Silva said a prophet also existed to “announce a new way of doing things”. “We have to understand that we are the Church and we must take our right place in the Church and commit ourselves,” he said. Close to people: Then-Archbishop Oscar Romero in an undated photo greeting worshippers in San Salvador, El Salvador. The process towards Archbishop Romero’s beatification on May 23, 2015, was slowed for some decades but reopened by Pope Benedict XVI. Mr Silva will be joined by Salvadoran catechists in Rome and will meet with Pope Francis following the canonisation. Pope Paul VI will be canonised with Archbishop Romero, along with four others. Pick up The Catholic Leader next Sunday for more details of Mr Silva’s recount of protection from harm as a catechist in El Salvador and the October 14 canonisation.